Being open to collaboration is a key to building a personal learning network (PLN). We used to know how to know. We got our answers from books or experts. We’d nail down the facts and move on. But in the Internet age, knowledge has moved onto networks. There’s more knowledge than ever, of course, but it’s different. Topics have no boundaries, and nobody agrees on anything. Yet this is the greatest time in history to be a knowledge seeker… if you know how. Steven Johnson also contributes to the discussion of the importance of collaboration in the video Where Good Ideas Come From, noting that networks are needed to germinate and spread ideas. Your own network of collaborators might be made up of dozens or even hundreds of people with different interests and areas of expertise. You probably engage with them through a variety of modalities: face-to-face conversations, texts, or over a multitude of social media outlets. Consider all of them as members of your PLN. While PLNs are not new, the platforms they are built on today have changed. Many teachers use social media to create their personalized, digital PLN. In these informal professional development networks, Twitter is often the platform of choice because of its immediacy in finding practical solutions, answering questions, and identifying resources related to teaching. In this module we focus on online opportunities to collaborate. The Internet diffuses connections and ideas more effectively than most of us could have imagined just a few years ago. In fact, the earliest online communities shed light on the promise of how collaborative online spaces could become the locus of rich and vibrant experiences in learning together. You can create an online space that allows for this exchange within a teaching and learning context in one of two ways: through participating in digital communities for learning, or by building your own personal learning network. The former is a more formalized structured space, whereas the latter is more personal, built entirely by you. A good collaborative community may reflect the guiding principles found within a “community of practice,” which has been defined as a group “of people who share a concern or a passion for something (domain) they do and learn how to do (practice) it better as they interact regularly” (Lave & Wenger, 1998). 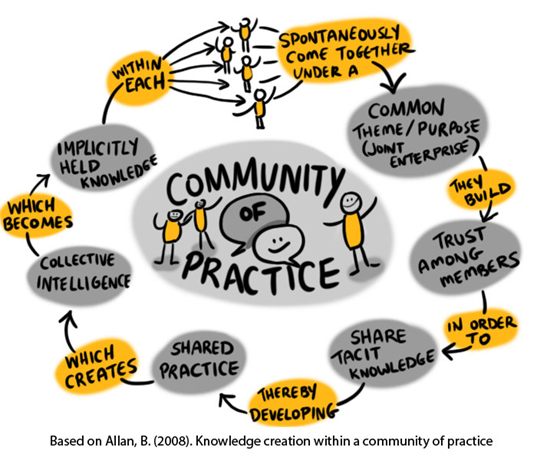 To better understand the role of communities of practice, read the post from Dr. Tony Bates: The Role of Communities of Practice in a Digital Age . Domain: a shared knowledge and skill within a focused area. Community: individuals converging and learning together. Practice: sharing strategies, tools, resources and examples through a knowledge exchange. The aim is to broaden your network to include cross-disciplinary skills and insights, and the online world affords just that. You will find that you can often meet peers and potential collaborators through chance online meetings in discussion groups or by using social networking tools such as Twitter. Watch the video Using Twitter Effectively in Education, with Alec Couros. Alec Couros is a professor at the University of Regina. He is a leading thinker in digital skills for educators and the development of PLNs. Couros explains his thinking about Twitter in the video and why you might want to “follow” particular educators or monitor specific hashtags. If you don’t have a Twitter account, we urge you to sign up for one (https://twitter.com) and to spend some time exploring. If you aren’t sure who you should follow as a Twitter user, ask your colleagues for suggestions. Here are some guidelines to get started. Think about the past year of your professional life. List the projects or ideas that you have collaborated on with others. On a piece of paper, or using graphics software, draw a dining table. Were they part of or outside of your discipline? How did your skills compare with theirs? At the centre of the table list the modes and communication tools you used to collaborate. Note which ones worked better than others. Highlight the type of people and processes that you know work well for you. Identify anything that is missing from the table—anything you need to consider for future collaborations. Take a photo of your “collaborative dining table” and tweet it to @ontarioextend using the hashtag #oextend. Or post it in your blog and tell us more about it.